Jessie Keyser’s life is a typical one for a child of Clifton, Indiana, in 1840. Her day starts early, helping her mother with her nursing duties. Then it’s off to school to recite her lessons. After school, she pays a visit to her father at his blacksmith shop before coming home to do the chores. “What’s that?” Jessie’s voice shook a little. Jessie is stunned by this revelation, but there’s more. For unknown reasons, the people in charge of the Clifton preserve are deliberately withholding medicine from the diphtheria patients and forbidding anyone from leaving the village. Someone needs to sneak out of Clifton to find help, and Jessie is the one to do it. But how will a girl who grew up in the 19th Century even be able to survive in the 20th Century, let alone accomplish her mission? 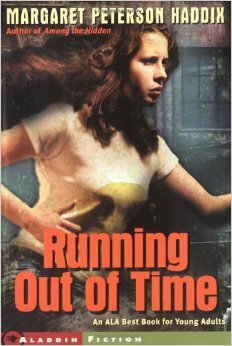 Running Out of Time, by Margaret Peterson Haddix, is a story of mystery and survival where lives are dependent upon the wits and courage of one girl.